* Crafted coming from heavy duty high quality 900D oxford fabric. * Treaty inner framework backpack with ability 70 litres. * Contoured, adjustable, padded shoulder straps. * Solid mesh lumbar pad for convenience as well as airflow against your back. * Flexible totally padded waistline waistband with broad locking. * This heavy duty large backpack is actually of good quality. It is actually an efficient product at budget-friendly cost. * Made from wonderful water-proof as well as anti-scratch 900D oxford fabric as well as being actually sophisticated, it will certainly create you have a happy comfortable travel. * It is actually simple however useful concept possesses sufficient areas for all your needs. PRODUCT PARAMETERS: Dimension 34 W x 80H x22 D cm, Capacity: 70 L, Weight: 2.5 kg WATERPROOF:Durable Water Resistant Anti-Scratch 900D Oxford,with Rain Cover in the bottom, which is attached with the backpack so that you can extract it when you need it. 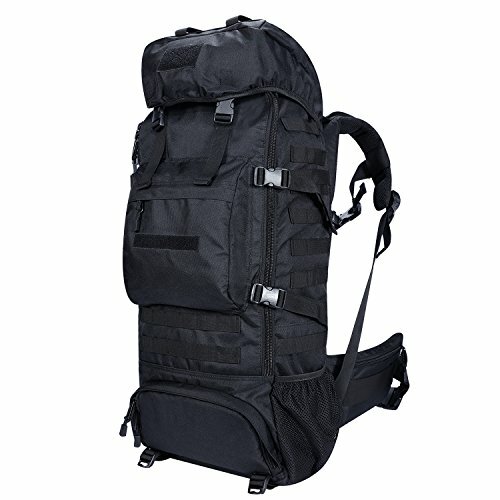 CR CARRYING SYSTEM: Weight decomposition system, could be adjustable for 3 sizes, high elasticity sponge with Airflow channels keep your back cool and dry MOLLE SYSTEM: MOLLE external expansion system designed to be used in combination with other equipment, you can load pockets, water bottle bag, accessory kits and other CONVENIENCE:The main bag is spacious with a laptop compartment and can be widely open for easy putting and easy getting. And there is one front zipped bag, two side net pockets and one bottom compartment for shoes or other belongings.